90 million euros for the future - Made in Germany. The DEUTZ-FAHR brand has stood for reliable, innovative German tractor technology for over 100 years. This has made the brand successful worldwide. In order to further expand this brand core, the SDF Group went on the offensive. 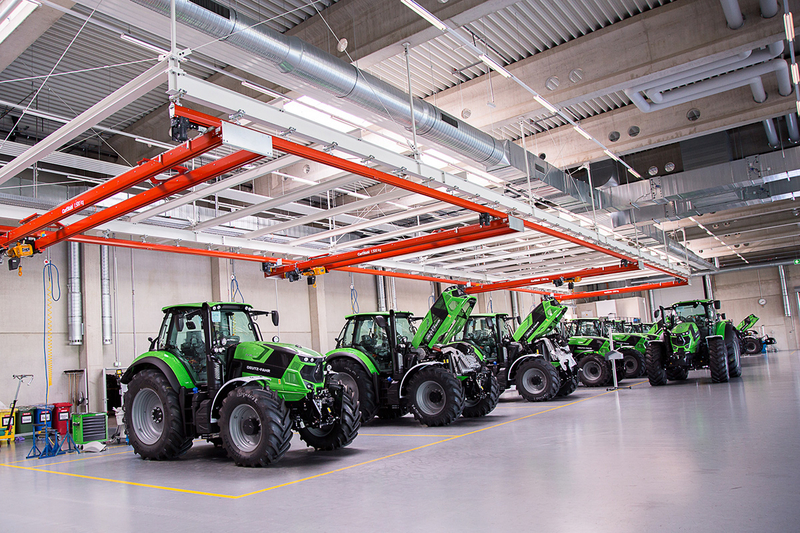 Under the name DEUTZ-FAHR LAND the most modern tractor factory in Europe was built in Lauingen an der Donau in Bavaria. Since 2016, tractors up to the largest Series 11 have been produced here. For many years Carl Stahl GmbH has been a competent and good partner for Same Deutz-Fahr in the field of slings, special load handling attachments and service as well as for smaller crane projects. In the course of 2014, Carl Stahl received information from the customer that Same Deutz-Fahr was planning a new tractor plant in Lauingen an der Donau. It was already clear here that all well-known dealers and manufacturers would be inquired. Carl Stahl provided the customer with technical documentation for the preparation of the specifications for equipping the plant with crane systems in several meetings. The idea and wish of SDF was that one supplier could plan, project and deliver all crane requirements. With this background knowledge, Carl Stahl was able to select the right manufacturers from the circle of proven partner companies in order to meet all customer requirements. 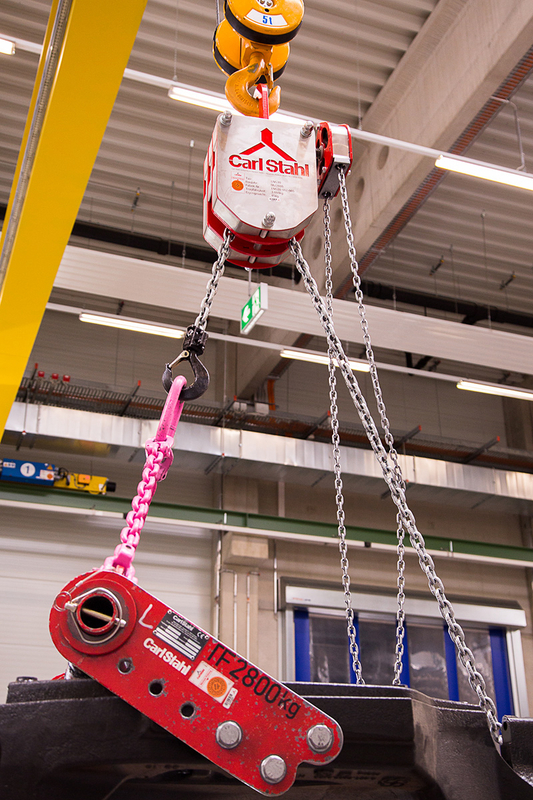 With the companies ERIKKILA for lightweight crane systems, AXXIA for large and indoor cranes and KITO for series hoists, the right partners were quickly found. 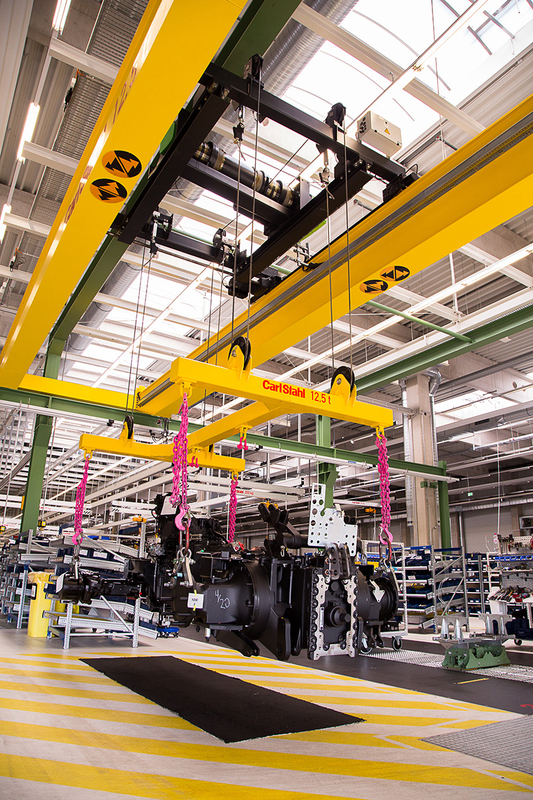 In advantage to large crane manufacturers, Carl Stahl was able to meet the specific customer requirements in detail. At the beginning of 2015, when the specifications were available, the first offer was handed over to Deutz-Fahr for budget planning. This offer was adapted several times to the customer requirements, its assembly procedures and processes. 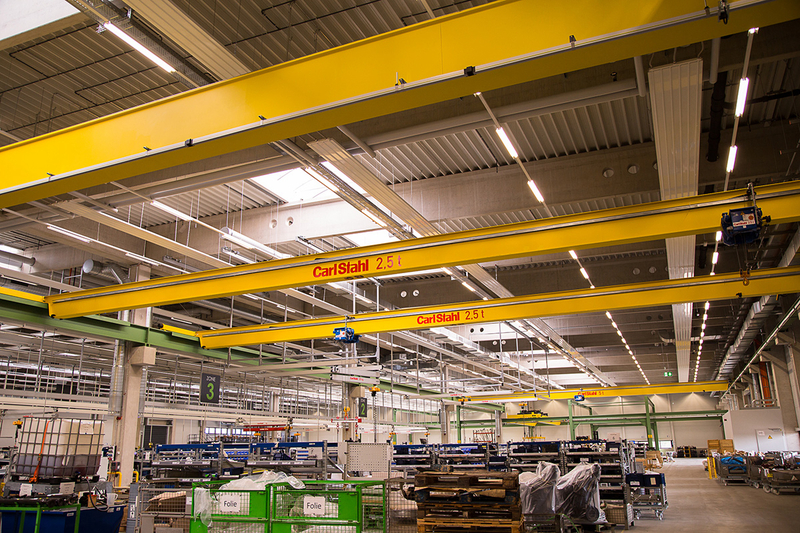 At the same time, electric chain hoists and electric balancers of our partners KITO and WiMa, as well as the new aluminium rail with internal conductor line from ERIKKILA were sampled at the customer's site and made available for testing. Now Deutz-Fahr had released our products after successful sampling and discussions with well-known reference customers from the agricultural machinery industry. 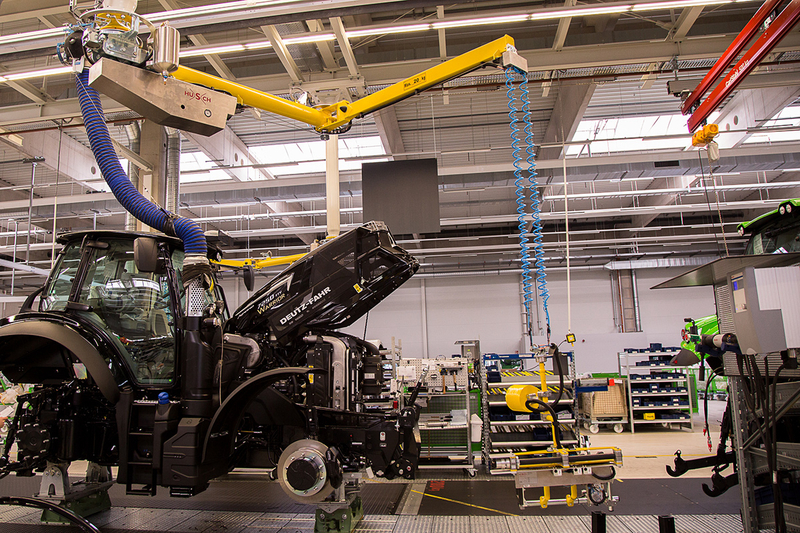 At the end of November 2015, the contract award negotiations took place in Lauingen with the purchasing, project and production management departments of Deutz-Fahr. From originally 15 suppliers, Carl Stahl had made it into the final round of negotiations of the last three remaining. At the beginning of December 2015, after intensive negotiations with the purchasing management and technical planning, Carl Stahl was pleased to have been awarded the contract. 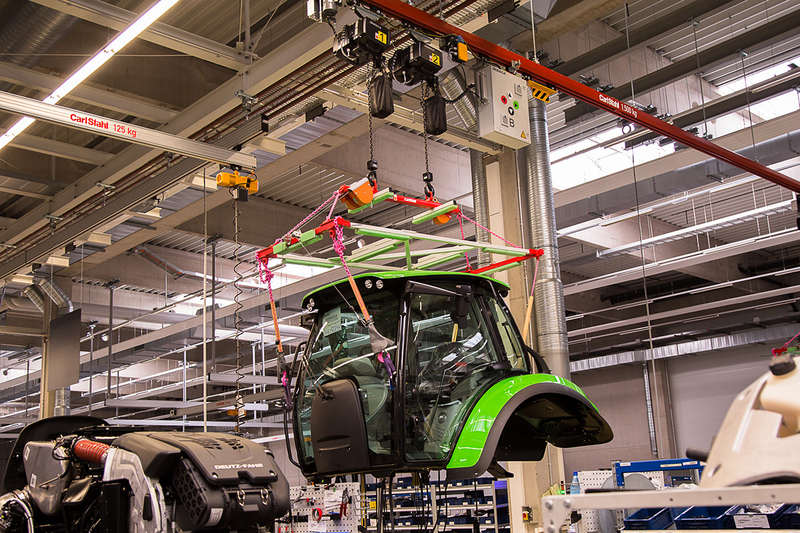 After the technical and commercial clarification with our suppliers had also been completed, the first appointments with the Deutz-Fahr project management followed on the construction site of the new tractor plant. In cooperation with team leader Karl-Heinz Dettling and key account manager Simon Dürner, the coordination was handed over to an experienced external site manager. For fine-tuning purposes, discussions also had to be held with partner ERIKKILA in Finland, KITO in Düsseldorf and Axxia in Nümbrecht. The first deliveries took place from January 2016. At the weekly Jour Fixe, the individual steps for the implementation of the schedule as well as the technical handling were discussed with the project management of Deutz-Fahr. Due to unplanned influences, which are almost unavoidable in such large projects, the schedule could not be adhered to exactly at all points. Thereby the originally planned end date has been postponed to September 2016. The complete handover of the plants described in the basic contract thus took place at the end of September 2016. The reliability of all partners was one of the factors for the successful execution of this extraordinary project. The Carl Stahl team is proud that it has also received recognition from renowned companies in the industry for carrying out the project. Due to the high competence in the implementation of the crane project, Carl Stahl was also commissioned with the planning and manufacture of the required load handling equipment, as well as the periodic inspection of the systems. Vacuum technology with low overall height on a circular path for hood assembly. Kito Europe GmbH: Supplier electric chain hoists up to 1,5 to.